The Castle Doctrine is a game that you can never win, but that's kind of the point. The tremendous satisfaction to be had along the way to losing makes it one of this year’s best games. The Castle Doctrine was released in January 2014. The Castle Doctrine is currently posting a score of 58 on Metacritic. These two facts combined mean that it is likely to be overlooked in the upcoming rounds of Game of the Year deliberations at various video game sites. In a last-ditch effort to counteract this, I’m here today to tell you that The Castle Doctrine is one of this year's best games. The Castle Doctrine is a supremely unforgiving experience. The first thing the game asks you to do is fill your house with traps to fend off intruders. At this point, your natural instinct will be to pack your entryway full to bursting with guard dogs, electric floors, and whatever else you can afford. Cruelly, the second thing the game asks you to do is get past your own security. Whatever devious mechanisms you’ve just deployed now become death traps for you to stumble into. Your trusty guard dog turns against you and rips you to shreds as your family rushes past you on their way out the door. Once you get over your initial tendency to get killed by your own dog, you can start to think about more effective starting house designs, like my preferred one here. Fast forward a bit. You finally figure out how to build the ultimate security system. You’re able to defeat it without issue, but every intruder that sets foot in your house is quickly dispatched by your expert traps. You use the bounty money on their heads to build yourself an even better security system, one filled with sturdy concrete, convoluted passcode locks, and obfuscated magic dances, requiring a single, super-precise set of movements to defeat. You know that set of movements. You know it back-to-front because you designed the system. You know it so well you’ve become accustomed to quickly running through it every time you make a minor tweak to your design. And then one day you make a minor tweak that isn’t so minor: you remove a crucial connecting wire and forget to put it back. As you test your system, you realize something is wrong. That door isn’t opening the way it normally does. Your guard dog is approaching fast and you’re out of options. Your own dog mauls you to death and you lose everything. All of your progress in the game thus far is completely lost — your house, your money, your tools, your reputation, your name. Everything is gone and your only recourse is to start fresh with a brand new house. 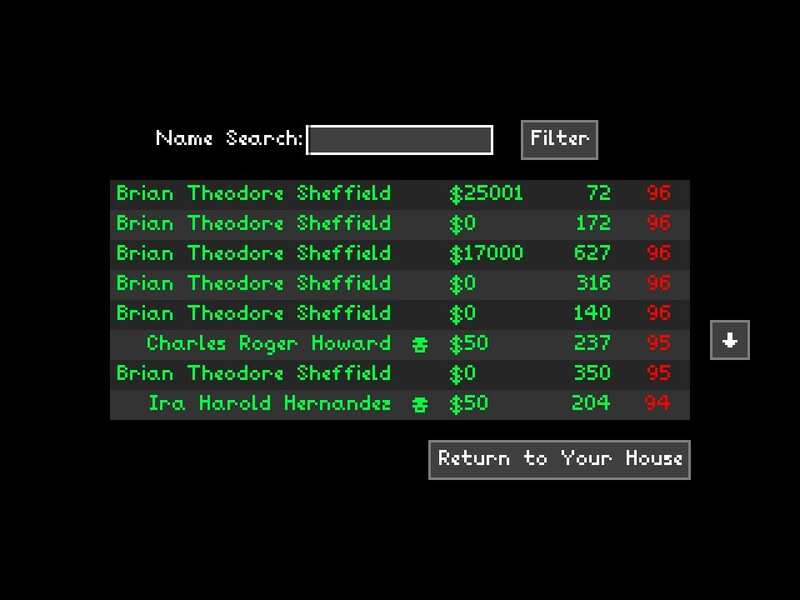 Even if you don’t kill yourself in your own house, somebody like Brian Theodore Sheffield will eventually come along and take all your money. These scenes are emblematic of the gameplay experience for The Castle Doctrine. You will repeatedly feel screwed over by the game, by your fellow players, and by yourself. The Castle Doctrine exists to provoke the experience of being screwed over, and that’s an incredibly compelling thing. There is tremendous satisfaction to be had here, not from the screwing over itself, but from the profound human urge to defy the screwing over and hold out against all odds and good sense. Every time your navigate your own unbelievably complex security system, make a few improvements to it, and then navigate it again. 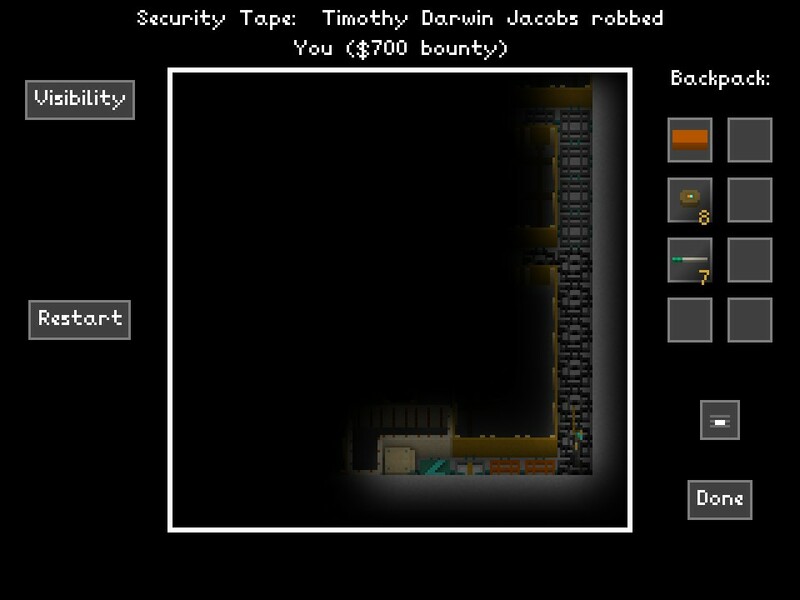 Every time you watch another robber get oh-so-close to your vault of money, only to be defeated by your ingenuity. Every time you learn from the techniques robbers use to defeat your system, and use those learnings to make it even more bulletproof. Every time you do any of this, you are engaging in a fight against inevitability. You will fail eventually. Absolutely guaranteed. But everything leading up to that is one of the most compelling battles of human wits available in a video game. This guy got within two squares of reaching my vault before he ran out of water to short out the electric floor. He then promptly hung himself. The Castle Doctrine also tells us something about ourselves, and about the folly in our own pursuit of perfection. The more successful your house is at defeating robbers, the more attractive it becomes as a target. The more perfect your home security design gets, the more likely you are to lose everything to your own mistake. The better you get at the game, the harder it becomes for you. There is no winning at The Castle Doctrine; there is only losing, but the part before the losing is really, really excellent.